Now There's More to do Than Ever Before! The Myrtle Beach and surrounding areas continue to grow by leaps and bounds every year. Myrtle Beach continues to be your number one destination for the perfect family vacation offering something for everyone in the family to enjoy! Here is a list of area attractionswith tickets available through Guest Service. For more information on any of Myrtle Beach's wide array of area attractions, or shows call the Myrtle Beach Chamber of Commerce at 1-800-356-3016. Brookgreen Gardens was founded in 1931 on the site of four former colonial rice plantations dating back to the 1700s. It was the first public sculpture garden in America and is a National Historic Landmark consisting of 1400-plus works of American sculpture showcased throughout breathtaking gardens and galleries. A History and Wildlife Preserve, Brookgreen offers educational and cultural tours and programs that are available for seniors, adults, children, and groups of all ages. Enjoy guided/self-guided Sculpture Garden tours, Creek Excursions aboard "The Springfield", a 48-ft. pontoon boat, that glides along former ricefields. There is also the Whispering Wings Butterfly House with butterflies native to the Southeastern United States, an AZA accredited Zoo with wildlife native to the Lowcountry, and the Enchanted Storybook Forest for children. Lunch services are available at several locations. Recently named by TripAdvisor as one of the "Top Ten Public Gardens in the United States", Brookgreen is wheelchair accessible, open year-round, and is located just 25-30 minutes south of Myrtle Beach. Located at Broadway at the Beach, WonderWorks is the perfect Myrtle Beach attraction for children and adults alike. Known to many as the “upside-down house,” WonderWorks is a great place to visit on a rainy day, a hot day, or a cool day in Myrtle Beach. The entire attraction (except for Soar + Explore) is located inside, making it the perfect escape from the elements. WonderWorks in Myrtle Beach features a large array of exhibits from the Tesla Coil, to the WonderSimulators to the ever-popular Bubble Lab. Combining learning, fun and wonder, this attraction will boggle your mind, increase your knowledge and make you smile all within your visit. Over 100 hands-on interactive exhibits are included in the General Admission ticket. Experience the 6D XD Motion Theater, Virtual Sports, 360 bike and much more! Purchase Discounted tickets at Guest Services! Be sure to visit this popular Myrtle Beach attraction on your next vacation! Soar and Explore is the newest attraction at Broadway at the Beach and provides a thrill seeking experience for adventurers of all ages. Climb three levels of ropes on the pirate-themed challenge course that stands 40 feet tall. Navigate 33 different challenge elements which are designed with more than 3,000 ropes and cables. Continue your adventure as you soar 50ft above the water on the 500ft zipline across Broadway and back. Requirements - 42"min. with a chaperone or 48" min. without for the ropes course. 54"min. for the zipline. Closed shoes required and waiver for 18 and over. Mother Nature's very own art gallery. Be surrounded by sharks while traveling on a moving pathway. Wind your way through an authentic rain forest. Explore the mysteries of the sea. A collection of some of the most unique underwater creatures in the world. Myrtle Beach Area Live Entertainment Theaters: Information available at our PirateLand "Guest Services". New for 2014 - "Hot Jersey Nights", "Illusions of Magic" and "Jersey Nights Christmas Special"
In a dramatic change, hoist the Jolly Roger and tilt her sails to the wind matey! Pirates Voyage is docking in Myrtle Beach! 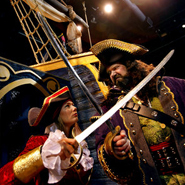 The spirit of Blackbeard and his buccaneers, Captain Kidd and Anne Bonnie sailing the coast of the Carolinas. Guests will experience the spirit and swashbuckling excitement of the pirates who called the Carolina coast home. The Crimson and Sapphire pirates battle each other on deck, in the water and in the sky above their full sized pirate ships in a 15-foot-deep indoor lagoon to the cheers and delight of their fans in the arena. Which side will take the treasure? It’s up to you to cheer them to victory! Legends In Concert’s all-new, state-of-the-art theater is located conveniently in the heart of Myrtle Beach at Broadway at The Beach. Visitors not only get to experience the World’s Greatest Live Tribute Show but can also indulge in the bountiful and wide selection of shopping, attractions and dining choices located right next door to our theater before or after our show. Each season features a new lineup of tributes to today and yesterdays’ greatest musical legends; all backed by a hot live band and electrifying dancers. This 100% live production with 5 Great Acts in 1 Grand Show also feature the ultimate audio, lighting and visual experience that has wowed crowds nightly for 19 years in Myrtle Beach! Featuring a variety of great music and comedy from country to bluegrass to rock and roll. Incredible musicianship, breathtaking harmonies, side splitting comedy in a warm, intimate and personal show that makes you feel good all over. Calvin Gilmore’s newest show is Good Vibrations! Relive the 60’s, 70's and 80's in a virtual tour of the glory days of American popular music, brought to life by the extraordinary singers, musicians, and dancers of The Carolina Opry cast. From the Righteous Brothers to the Rolling Stones, from Elvis to the Beatles, Good Vibrations is an evening of fun for everyone. Get in your groove! Feast on a four-course banquet. Enjoy a spectacular pageantry... Gallant knights competing in dramatic horsemanship, sword fighting and a true jousting tournament. Caledonia has consistently won national awards since opening in 1995. Some rankings and awards include Golf Digest’s "Fifth Best New Public Upscale Course," Golfweek’s "Top 100 Modern Courses" for 1999, was the No. 1 golf course in Golf Digest’s "50 Best Places to Play-for Women," was No. 17 in Golf & Travel’s "America’s 40 Best Public Courses. Caledonia is built upon the site of a historic 18th century rice plantation in Pawleys Island, S.C. The 6,500-yard, par-70 course has been described as having "18 signature holes," with holes routed around majestic oaks and meandering streams. Named the 4th Best New Public Upscale Course in America by Golf Digest. The layout features vast waste areas and incredible elevations. The rugged terrain and native vegetation of this once thriving indigo and rice plantation makes for one of the most spectacular settings in golf. For fishing in the ocean and in PirateLand’s lakes, the SC Department of Natural Resources requires guests over the age of 16 obtain a surf fishing license. CLICK HERE TO PURCHASE ONLINE directly from DNR. You may also visit our Front Office to purchase a license.